downtimed is a program for monitoring operating system downtime, uptime, shutdowns and crashes and for keeping record of such events. downtimed is a daemon process which is intended to be started automatically from system boot scripts every time when the operating system of a server starts. First the daemon logs its findings about the previous downtime to a specified logging destination as well as in a database file which can be displayed with downtimes command. Thereafter the downtimed daemon just keeps waiting in the background and periodically updates a time stamp file on the disk. The time stamp is used to determine the approximate time when the system was last up and running. In case of a graceful system shutdown it records a stamp to another file on the disk. These files are used for reporting the next time the daemon starts. 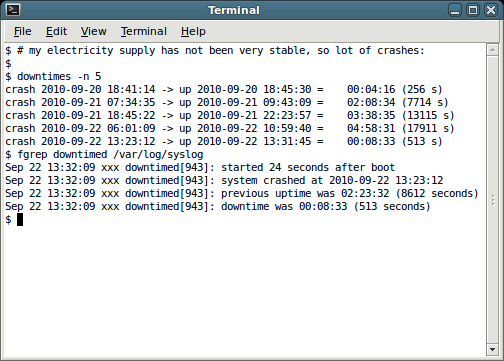 downtimes is a command-line tool which can be used to inspect previous downtime records recorded in the downtime database file. This sofware works currently on recent FreeBSD and GNU/Linux based operating system distributions. It can be ported to other modern UNIX-like operating systems relatively easily. The software is available under Simplified BSD license. -d downtimedbfile- Use the specified downtime database file instead of the system default. -s sleep -- Calculate the approximate crash time by specifying what was the sleep value of downtimed. -v Display the program version number, copyright message and the default settings. Hello i am getting the same error when i try to install the downtimed. I am new to ubuntu can you help me out.